Here I’ll give my experience with Veerotech hosting company (affiliate link). I’ll try to provide performance metrics and be as objective as possible. A separate post offers explanation of all the metrics and how to compare hosting offers. Since I am currently using that hosting, this post is a “work in progress” – new metrics and experience will be updated as time goes by. All the provided knowledge is “to the best of my knowledge and experience”. This review is not approved, endorsed, nor in any way supported by Veerotech company. How I came to Veerotech? Today, February 24th 2019, Veerotech is a privately owned company without any outside, or other company capital (leverage). They were founded in 2010, with headquarters in Raleigh, North Carolina (USA). They own and maintain all of their hosting equipment (no leasing). Types of hosting offered: shared, reseller and (KVM, both managed and unmanaged) VPS. 2. How I came to Veerotech? In the spring/summer of 2018 I started having problems with BikeGremlin website. I admit, mostly because of poor website optimization. However, along with figuring out how to optimize, I also started reading and enquiring about hosting providers. I concluded that the current provider (Justhost – my review) is not the best one. Who’s interested, based on that research, here are my hosting recommendations. Veerotech got good reviews and user experiences written on WebHostingTalk forum. Also, since I realized that I should seek reseller hosting, owner of digitalFAQ, a lot more experienced in this field than I am (I’m a novice – take all the info here as is), said that he can recommend MDDhosting and Veerotech for reseller hosting (though, he was open and honest to note that his information and experience with these has not been updated very recently). It was February 2nd of 2019. For days before I was in bed with over 39 °C temperature. I had just got a little better, needed to put my brain to work again, without it being too exhausting. “OK, I’ll test this reseller a bit”. So, on that day, I “bought” a new hosting and tried moving a test website there. It was a steep learning curve for me. Couldn’t make it work on the first day. Nor on the second (few hours work per day, still feeling weak). In time I got the hang of it (and wrote myself a website migration tutorial, so that I don’t have to bang my head next time). 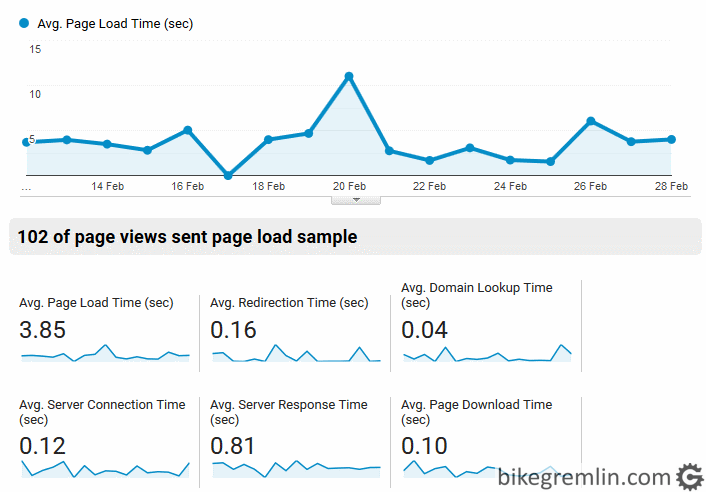 First I migrated a test site, then a new one (without traffic) and finally, in February 11th 2019, BikeGremlin was moved to Veerotech hosting. Using Cloudflare helped a lot with this. I didn’t have to wait for a change of nameservers to propagate to all the DNS-s (hours, or days), but could just change server IP address in Cloudflare’s DNS and it was propagated momentarily. 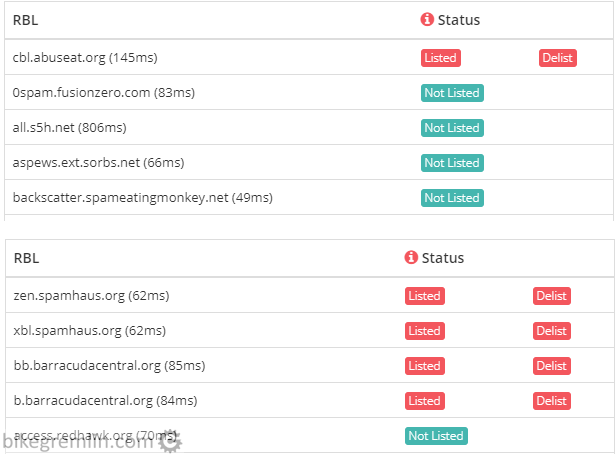 Of course, it took some testing and tuning – primarily LiteSpeed caching. Problems were with the search option (spying glass in the top right corner) and with AMP implementation. Both problems were solved with fine tuning LiteSpeed caching plugin. Didn’t even realize it wasn’t working properly at first (note to self: check AMP validation and search option functioning when migrating a website 🙂 ). I took the cheapest reseller package: “SSD VR-10 Reseller“. Below is the list of resources that came with it at the time of writing this post. I also made an explanation what each hosting resource means – including “unlimited” and “unmetered“. Backups: yes, using R1Soft, made daily, kept for the last 15 days, downloadable. “Backup Wizzard” included in cPanel. EDIT 2. April 2019: Veerotech switches to JetBackup, so backups from April the 2nd are available with this tool. R1Soft backups are no longer automatically created. Many praise JetBackup as a better solution. Fortunately, didn’t have the “pleasure” of putting any of these to the test. 🙂 What I like with JetBackup is that backups are downloaded from within the cPanel, using the same https connection. R1Soft backup download was done by redirecting to another address, using non-encrypted http protocol, which seamed less secure to me. So i suppose this is an improvement. Constructive discussion on R1 vs Jetbackup on WebHostingTalk forum. Cloudflare integration through cPanel, including (in the price) Railgun integration (good if visitors are on another continent from where the hosting server is located) is included in the basic price. Getting this service directly through Cloudflare costs a lot (I think it’s provided starting with Business plan, from 200$ per month). CloudLinux is installed and resources per cPanel are limited/guaranteed using that “tool”. If planning to use their hosting, It’s not bad to get acquainted with Veerotech’s TOS, (where SLA is also defined), AUP and service support scope. Whoever knows anything about hosting claims that server location is important. In spite of all the fast backbones, CDN-s etc. I did mention above that Veerotech offers Cloudflare integration with their Railgun service, that enables faster data delivery from remote servers. Still, it’s only fair to list the server locations they offer. There are providers that offer various server loactions – Europe, USA east, and/or west coast etc. Veerotech has servers exclusively in North Carolina (USA east coast). What I like is the fact that they own their servers -there are providers that are hundreds of miles away from “their” hosting servers, with another company doing the hardware maintenance. It’s not a big deal, if the “outsourcing” company is a good one, but I feel better (100% subjective remark) knowing I’m having business with the “1st hand” so to speak. US east cost server location is good if one wants to “cover” both the US and European visitors. For Europe “primarily”, it would be better if server location is in Germany, Holland, or “at least” the UK, of course. I wrote in detail on website performance measurement in the post: Measuring performance. It all looks fine for the start, but I’ll be monitoring the situation in the following month, or two and then have some better, comparable data. English and Serbocroatian website versions (bike.bikegremlin.com and bikegremlin.com) are implemented using two separate WordPress installations. They are practically two separate websites. With Veerotech I installed them to two separate cPanels. With a third, “control” test website on a third cPanel. Then I set up a test with Load Impact, to simulate 50 simultaneous english website (bike.bikegremlin.com) visitors for 5 minutes (more is not allowed with the free version). I deleted all the cache from Chrome browser. After having started the Load Impact test, I started randomly opening pages on all the three websites (English, Serbocroatian and control site) – alternately. The idea was to see if any of the websites will start performing slowly. 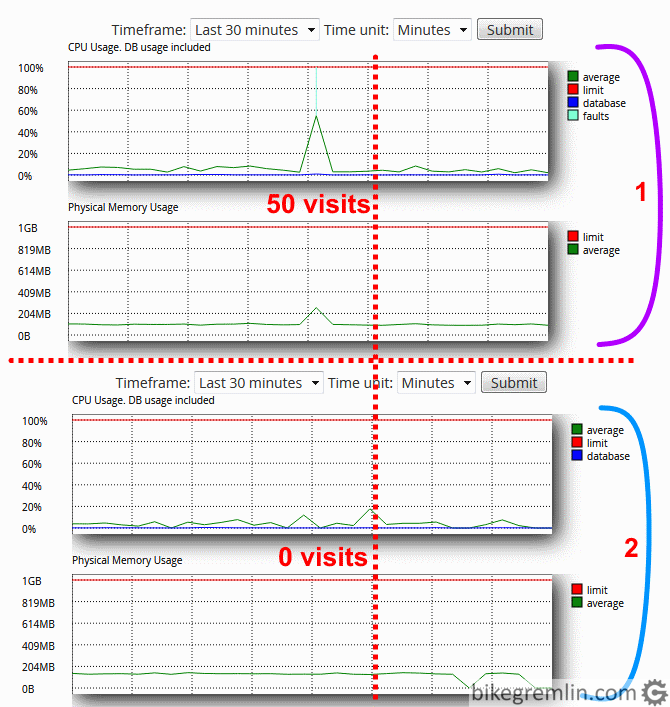 Simultaneously I had opened cPanels of each website and followed real-time reports of CPU, RAM and other resources, to see if they will increase for all, or for just the “loaded” website. Before, during and after tests I used GTmetrix and Dotcom-Tools to check and compare results. I had failed to measure any performance drop – with either the “loaded” website, or the others. Nor could I get any of the test tools to show a performance drop, both before, during and after the tests. No noticeable / measurable slowing down in page load speed on any of the websites. Repeated the test several times, on two different days. Always got similar results. With previous hosting, 20 virtual visitors from Load Impact would cause the site to load noticeably much slower, while 30 would cause it to crash (“Error 500…”). With Veerotech? 50 virtual visitors at the same time and not even noticeable change. I am aware that these are not some enormous numbers of visits, but the difference from the previous hosting is noticeable. The third, control website, also didn’t show any increase in resource use. Veerotech has properly implemented resource division (CloudLinux). It works exactly as promised: each cPanel gets its resources, and different cPanels don’t affect each other (in a measurable way). In time I have been checking resource monitors. Most of the time, the load is below 20%. CPU is the most used (occasionally gets even over 50 % load), then RAM (gets to about 40 %), while other resources are almost all the time not used with more than 20 % load. There is a knowledge base, with lots of information, instructions and answers to frequently asked questions. So You can solve most “standard” problems without bothering anyone else. If You do open a ticket and ask for support, reply time is usually below 8 minutes. First reply (which most often solves/answers the topic) is often received within 5 minutes. Both for technical questions and for billing and service terms ones. System notifies You via e-mail when a ticket is answered, but it’s often so fast that You needn’t get away from the computer (it isn’t chat though, of course). Tech. support ladies and gentlemen are very polite, professional and patient. No complaints for now. So far no downtime, but I’ll be updating this, along with speed stats, as the time goes by. March: 99.98% – one 10 minute downtime, at night, on the 19th of March. Average page load time for Serbocroatian webstite. Average page load time for English website. This is more than twice as fast, compared to previous, JustHost hosting. *Without the 30th stats for English website version, average page load time is about 3.15 seconds. Note: if metrics results differ from subjective impression when visiting a website, I always check both my computers and the metrics methods and tools. What can be deceptive? 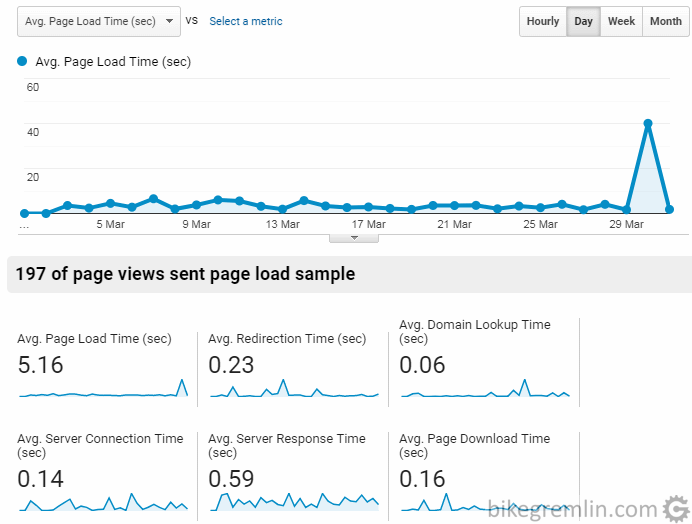 Slow, poorly set up computer and/or slow Internet connection can cause slow website page loads, even though metrics show it’s good. Fast computer, or/and located close to the server and/or browser full of cached website pages can cause (deceptively) fast website page loads, even though metrics show otherwise. “Normal computer”, with deleted browser cache, shows results that differ from metrics – check the tools and setup for measuring, something is probably off. OK, after a brief digression, first impressions: It’s all nice and fast. A lot faster than before the migration. Menus on provider’s website and cPanel look professional and nice – “clear”, easy to navigate. 25th February 2019. I realized that e-mails sent to visitors when they subscribe to the website (for confirmation and password setup) don’t reach the visitors. After going through the knowledge base, doing all as suggested I had managed to get this (English) website to work, but Serbocroatian one (bikegremlin.com) still didn’t send confirmation e-mails. These changes made the English website start working. They suggested I check SPF records in DNS. I checked that, saw it was off, along with domainkey record. They explained where to look within the cPanel which values to put there. So I did it. The problem was still present (with Serbocroatian website only, not with this one!). Then they confirmed that their SPAM filter (SpamExperts) was blocking the e-mails. I asked how come English website confirmation e-mails don’t have problems. They said it could be the different language – the reason why SPAM filter “thinks” they are SPAM and suggested I alter the confirmation e-mail contents, adding an “unsubscribe” link. There are thousands of WordPress websites using the same form of confirmation e-mail, and I don’t know that changing their contents is “a must”. It has worked fine on the two previous hosting servers (providers). I would have to edit functions.php (most probably), or install another plugin, just for this function of changing e-mail contents. Just seems like an “overkill”, standard confirmation e-mail is something that I shouldn’t have to worry about (I think, with all I know for now). They unblocked the blocked e-mails and suggested I wait a few hours and try again to see if it’s all fine now. If it doesn’t to let them know and they’ll check with SpamExperts how to solve it. 26th February 2019. Next day, still not working. I tried using webmail and writing a custom e-mail, with no links, to my gmail account, from both websites’ webmails, in plain English. This didn’t work from either website. 🙂 I informed tech support of all this and asked them to see with SpamExperts whether the problem can be solved. I had set up the reseller account with bikegremlin.com domain, but later, for ease of website setup and (potential) migration, I registered a “working” domain and asked Veerotech to “transfer” the main reseller account to that domain. That was all done before migrating any website. However, perhaps it takes some more changes in the “SPAM filter”, don’t know. I reminded the tech support of that fact, as a possible problem cause – couldn’t think of anything else. Testing using a third website, ivetamakeup.com to see if the problem exists there as well (separate cPanel, clean WP install). Same – not working. It then occurs to me that Veerotech offers Cloudflare Railgun integration. I also remembered that, of the three websites, bike.bikegremlin.com couldn’t get that integration, since Cloudflare couldn’t register a subdomain through the cPanel (Railgun is active for the entire bikegremlin.com domain, as tested, just bike.bikegremlin.com doesn’t have the cPanel integration enabled), nor could I “explain” to it that it’s the subdomain of bikegremlin.com and that it’s all nicely set up with the Cloudflare DNS. 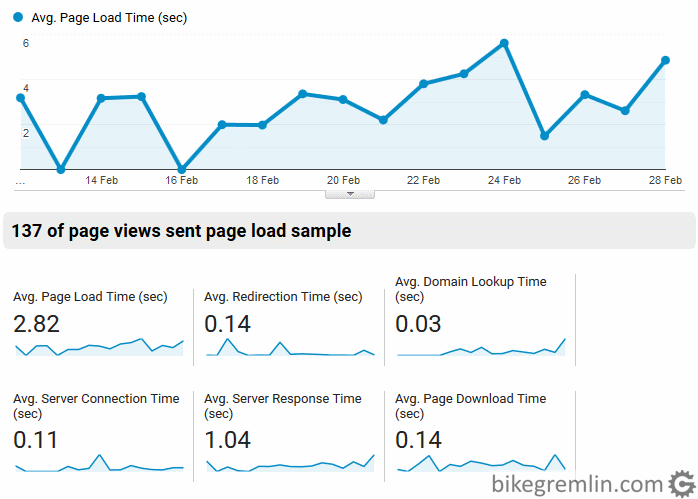 That is bike.bikegremlin.com is not connected with Cloudflare through cPanel at all. So I decided to make a test: disabled Railgun integration for ivetamakeup.com. It didn’t help. Bottom line: bike.bikegremlin.com is the only one without a cPanel “connected” with Cloudflare and the only one that works. I relay all this info to the tech support. They reply they have sent the report to the SpamExperts and are waiting for their report. Said the problems are not connected and they are domain dependant. We’re waiting to hear what the SpamExperts will say. Did some more tests with ivetamakeup.com – it too was still not working. Decided to open a ticket for that (as I was instructed – separate ticket for each domain). Again, tech support suggested it could be a language problem, triggering the SPAM filter. For this website, it was not a problem to “switch” it to English, so I did that. Tested – it worked! Switched back to “Serbian” – again, blocked. Now we are waiting for a reply from SpamExperts to see if they can fix/solve this. I am curious to find out if this is a “systematic” problem with SpamExperts for all the mail in Serbo-croatian (or perhaps all the “third world” languages), or just my bad luck? I’ll try to set up another domain with a “Serbian” website to see if it will have the same problems. This is important info for business websites that need e-mail communication (e-stores etc.). Still not sure whether it’s a SpamExperts problem so I should expect this of any host that uses SpamExperts, or it is both hosting provider and SpamExperts related. Not sure how all that works. In my experience with computers, it happens not rarely enough that something you don’t even check and “it is understood” to work can create headache and take time to fix. This is a typical example in my opinion. 28th February 2019. Still not working. I’ve contacted SpamExperts directly, using their website contact form, explaining my situation and asking for any info/explanation. Provided a link to this page for full list of how it went on, hoping they might figure a way to sort it out. Related topic on WebHostingTalk forum, where I also asked for help. Afternoon – receiving “ordinary” (plain text) e-mails has started working normally. SendGrid – requires additional DNS setings in order to work properly (offers several other methods as well). Free for up to 100 e-mails per day, later it requires paying, at reasonable prices. The fact that domain gets “verified” using DNS makes me think that e-mails will be delivered more reliably and with less chance of ending up in the recipient’s SPAM box. Sendinblue – simpler setup. Offers up to 300 daily e-mails for free, but for more e-mails, prices are roughly double compared to SendGrid ones. Looks like a better option for over 100 and below 300 daily e-mails for those on a tight budget. The problem with these services is you need to pay for a dedicated IP (costs from 25$ per month and up). Otherwise, it’s the recipient’s inbound mail spam filter that gets the e-mails blocked – since many spamers use these services (“e-mail blocked since it’s coming from a know spam IP address”). In the meantime, it seems that it’s all started working fine. 🙂 That is: works fine without having to use the above noted services. Hope it stays that way now. Will be monitoring the situation in the following days to confirm it is all OK.
There’s lots of spam and people sending it. What can a hosting provider do? They can make their outgoing e-mail filters to be “lenient”. In that case, problems like I’ve had would not happen very likely. However: a (bad) customer could send out lots of SPAM, which would cause the provider’s IP address to be blacklisted as a SPAM source. This would result in other customers (using the same IP address – shared hosting) having problems with the delivery of their e-mails – they would get blocked by recipients’ incoming SPAM filters. Other option is to be strict with outgoing filters. This policy has caused my problems. However, that is something that can be worked out with the provider (and SpamExperts), while getting a once blacklisted IP off that list is much more problematic and You depend on third persons to do so. There is no perfect solution. On top of that, when sending e-mails, sender has little control of how they are relayed, have they arrived and when exactly – that’s how the “e-mail technology” (protocol) is. Trying to be as objective as possible: the Veerotech e-mail policy is a justified one. You can go to another provider who isn’t as strict, with all the consequences that brings (as explained above). Choose what is the lesser evil for you. The reason for writing this review (it will get updated) is for personal reference and helping others. Likewise, the 9th chapter wasn’t written to make the provider look bad – if one reads it objectively and has ever experienced a (computer) problem that is “elusive” to put it that way. Tech. support did their job and fixed the problem – even though it, apparently, took a lot of time and (I presume) some effort. Claiming these things don’t happen regularly. All in all – above I’ve provided links with explanations of alternate solutions should one ever run into similar problems. One can also choose to avoid hosting providers that use SpamExperts (again, with all the noted pros and cons of that choice). I noticed that BackWPup backup plugin won’t work. Reports an error that it runs out of memory. This plugin does put some load on the server, while it packs and copies files. I had thought it was somehow “disabled” on purpose. I asked tech. support. First they suggested I increase memory limits in PHP options. Didn’t help. Then they said that from their testing, the plugin won’t work with PHP 7.2, but does with 7.3, so I switched to that. It stopped reporting errors, but didn’t save wp-content directory. They directed me to use cPanel backup option. Tested it, that works. However, BackWPup was convenient for doing “incremental backups” – saving the database, root and current year file uploads. That is not possible using cPanel and it is faster, creating much smaller files to download and upload. I asked if there is a way to enable BackWPup plugin to work. They told me to see with the plugin vendor, since the plugin was not made by them, nor provided, so it is not their responsibility to make it work. Plugin vendor supposes it is a hosting server problem – plugin support forum link. Hosting works stably and fast. I suppose one of the reasons is disabling plugins like this – that put extra load on the server. If considering this hosting, expect “strict rules” in terms of what you can do and use. Similar to SpamExperts problem, this too is a double edged sword, so each should choose for themselves what is a “lesser evil”: more freedom, or better performance (or a VPS to choose for yourself, but at a higher price). Update 16th April 2019: OK, my fault for not having thought of this earlier. The problem was not having enough disk space to do compression of a backup. 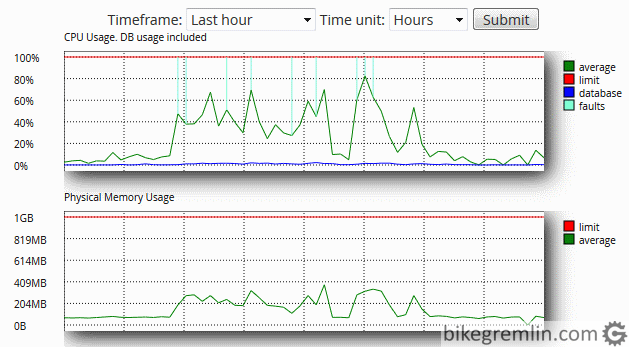 I had allowed over 1 GB of extra space on a site that used less than 300 MB, but BackWPup needed at least 1 GB more. Tested after providing more disk space and it works fine now. With PHP 7.3. For comparison, previous hosting (JustHost) shared server’s IP was not listed on any blacklists. I asked a question about this on WebHostingTalk forum. Turns out that for sending e-mails, it’s not good to have a blacklisted IP address. Edit 27. 3. 2019: number of blacklist results has dropped from 5 to 2, on a total of 99 blacklists checked, just a day after I had first checked. This probably means that one “bad” client had made a problem and that the host is now solving the issue. Will be monitoring this in the future. For both the new and the old hosting server IP-s. HetrixTools does offer that service for IP addresses as well as for the domain. Update 11th April 2019: currently IP is removed from all the blacklists. I put this at the end, almost as an afterthought. Which probably speaks more about me, than about Veerotech. 🙂 I primarily value reliability and speed, only after that criteria is satisfied do I look for which of the offers is cheaper. Most reputable good quality hosting providers have similar prices. This goes for Veerotech as well. From my experience with most products (not just hosting), one gets what they pay for, or less – never more! Veerotech offers good service for the money, so I’d say their prices are good – for what they offer, it’s not the cheapest provider. I also like that their service ranges are well scaled, so one can pay for almost exactly the resources they need, not more (or less). Good example of that is the package I took – “small” reseller for 12$ per month. I noted “important” packages and added short comments. All the prices are for monthly payment basis – providers offer some discount for paying a year, or more up front, but I wouldn’t recommend doing that. I am not sure what Veerotech’s support scope is for helping with WordPress website maintenance. Based on the prices, I’d guess it’s primarily a marketing use of the term “WordPress hosting” (could be wrong, haven’t tried it). On 7th April, when updating and adding website content, I started getting “Error establishing a database connection”. All the websites I hosted at Veerotech were affected. The problems came and went. Staying on for about 10 to 15 minutes at times. The problem continued throughout the day and the afternoon, so I contacted technical support to let them know. They said there’s a problem with MySQL, which was caused during the last update, and they’re aware of it, trying to fix it. Problems continued the following day, coming and going for a few minutes at a time – culminating in all the websites going down for about 10 minutes on one occasion. Today, 11th of April, problems still occur – rarely and for short periods though. When they happen, all the websites are affected, not just the ones being updated. Visitors can see the websites, but administrator logging in results in a database connection error display. Resolution prognosis couldn’t be estimated: “We are actively working on it”. These things happen. Websites are working fast and stably for visitors. Veerotech is a hosting company with very good reputation for reseller hosting especially, seems I’ve just come at a bad time. 🙂 Will be monitoring the situation, as well as speed and uptime and updating this review. Update: problem has been solved on April the 7th (according to info received from tech. support in the evening of April 11th), and the symptoms seen after that were caused by the problem explained in the next chapter. 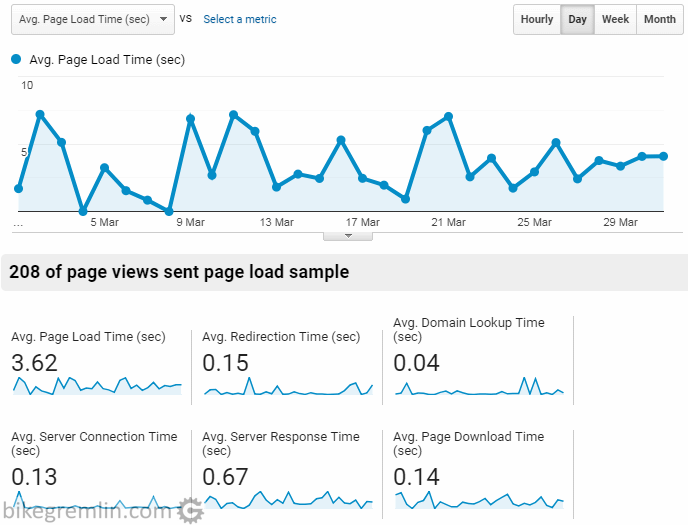 11th of April 2019, late afternoon – all the websites are down, with what appears to be Cloudflare not being able to connect to the hosting server (as if the server is down). Front page gets loaded sometimes, but no other links work. After about an hour, I contacted tech support. Fun fact: this happened in the middle of talks with a potential client about website migration – just as I was explaining that hosting quality changes and the important thing is to have control over domain registration (and name servers), have backups and always be prepared to migrate the website(s) if problems become too frequent, or service quality becomes poor. I also explained that problems always happen, only with good hosts they are not frequent (regular) and get solved (in reasonable time). “Take a look at my website now, for example…” 🙂 I got the job and the chosen hosting was MDDhosting Cloud 1 package – for it best fit the client’s long term needs in my opinion (in terms of server location, available resources, price and hosting company reputation). This makes perfect sense. Most security measures have a downside in my knowledge and experience. As long as this doesn’t re-occur regularly, I’d rather go with stricter security policy than a higher risk of hacking. Of course, it is up to the reader of this review to see for themselves what they prefer. It is only fair to note: all the problems have been resolved on the same they when reported, except the e-mail problem that needed a coordination with another company – SpamExperts. If You found this post (or website) helpful and want to sign up with Veerotech hosting, You can do so using my Veerotech affiliate link and support this website by doing so.